Again this year the Frascati National Laboratories had the chance to contribute to the growth of the interest of young generations in the fascinating and complex world of particle physics. guided tour of LNF, meeting a researcher at LNF but also at schools and public libraries, as well as specific activities designed for the little ones during the open days. During the current school year, we have hosted 5 primary schools and 13 lower secondary schools, for a total of over 1000 students! 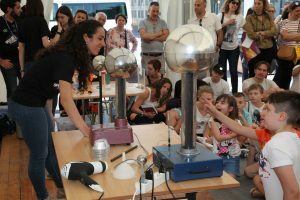 We welcomed a large crowd of little enthusiasts also at OpenLabs, the Frascati National Laboratories’ open day, during which activities beyond conventional teaching were scheduled and kids experienced physics playing with our researchers. See the gallery KIDS @OpenLabs 2018.